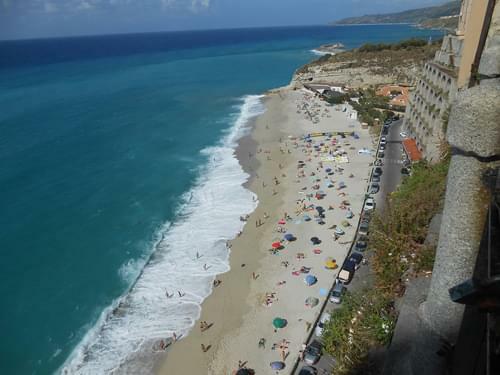 Of all the holiday destinations in Calabria, Tropea is perhaps the most famous. The town sits on top of an imposing cliff rising up immediately behind the turquoise sea and golden sand. 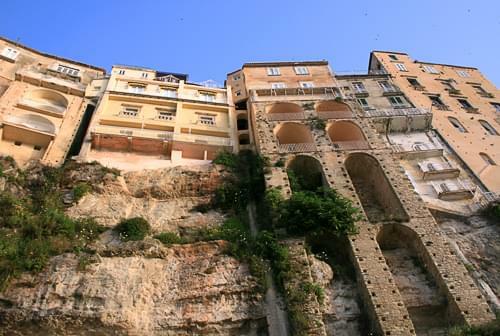 Houses seem to cling precariously to its side and your first view of Tropea will never be forgotten. 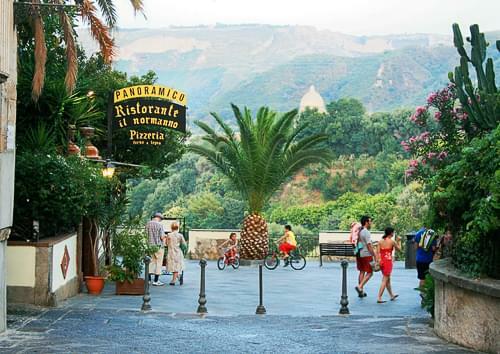 The town itself is quite small and one of the prettiest towns in Calabria. The cobbled streets are lined with old buildings made from golden stone and at various points you find yourself looking down alarmingly at the sea below. The sea is accessed via windy roads or some 200 steps. On a clear day you can easily see the volcanic island of Stromboli from the waterfront promenade and it is possible to book a boat trip over there for the day. If the volcano is particularly active it is well worth taking a boat trip out there after dark. 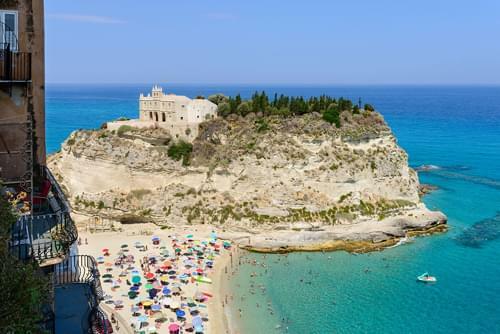 Another striking aspect of Tropea is the 'Isola di Tropea', a distinctive rocky outcrop which rises up from the beach a few hundres metres from the town. At the top is the monastery, Santa Maria dell'Isola, creating a wonderful image with the clear blue sea stretching behind it. Needless to say, it is a popular location for wedding ceremonies. Other buildings worth visiting are the beautiful Norman Cathedral and the churches of San Francesco and Santa Maria della Neve. Tropea is also one of the best preserved and most beautiful historical centres to be found in this southern region of Italy. So, here you have a stunning, historical town with endless little cobbled streets and beautiful old buildings. It is built onto and in a high, craggy rocky hill which looks down over dramatic views of azure blue sea and white sand beaches. 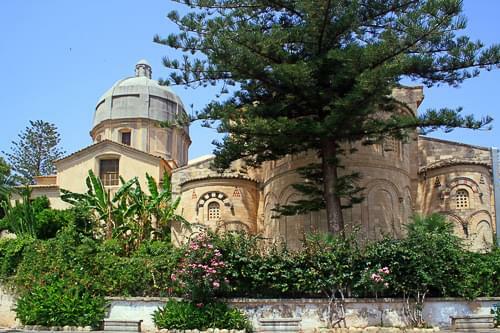 Added to this, the town is surrounded by green, undulated hills planted with vines, olives and citrus trees and everywhere there are large, colourful flowers and trees. 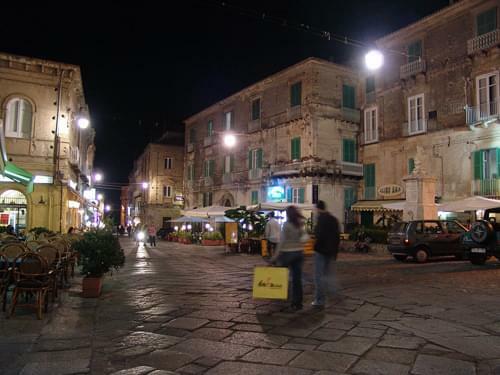 Tropea is full of bars, cafes, pizzarias and small and affordable restaurants serving traditional local meals. The local speciality is red onions and the Tropea Red Onions are well known all over Italy and much sought after. All the locals restaurants will have incorporated them into mouth watering local dishes. Last, but far from least are the beaches which must be the best in southern Italy. The azure sea is crystal clear and the smooth, white sand beaches shelve quite quickly into the inviting water. The climate is good and it is possible to swim here most years from May until November. If you are a keen photographer there could not be a better place than Tropea to spend your holiday. The views are equally spectacular from above or below and the beaches, old town, buildings, people and surrounding countryside offer you more photographic opportunities than you can dream of.